A while ago I posted about the things not to say to an autism mama. Sometimes people don’t think before they speak, and words come flying out of their mouth before they even consider whether they’re helpful or harmful. People really want to be supportive to families of special needs kids, but it’s hard to remember all the “rules”. I try to be sympathetic to this. You may notice that in my blog posts I go back and forth between person first and identity language. I tend to prefer identity language for A-Man, and when he’s older he will make the choice for himself which he prefers, but I use both on the blog because I know people who prefer person first. These “rules” that have come about with the special needs community aren’t what I’m talking about. 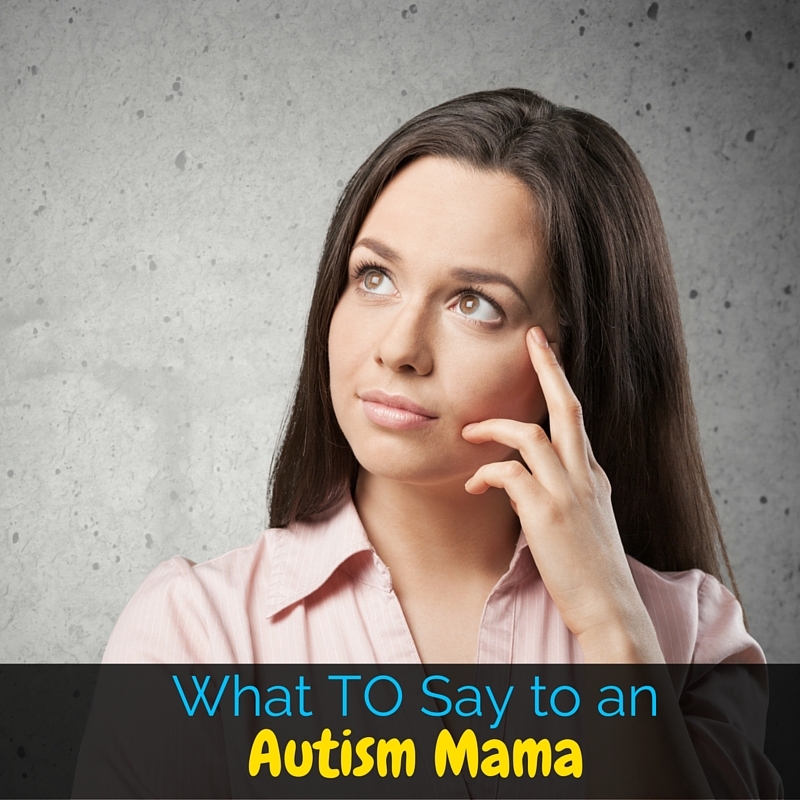 I’m talking about practical things that you can say to an autism mama to honestly support her. Things that are uplifting and encouraging without being condescending or hurtful. How Do You Feel About This?/How Are You Handling It? There’s a common saying in the autism community, “when you’ve met one person with autism, you’ve met one person with autism”. Every autistic person has different gifts, struggles, talents, and challenges. It’s a spectrum, and no one person’s autism will be exactly like another’s. This is also true for special needs parents. A-Man’s autism isn’t something that upsets me. We use identity language, we embrace the talents that come with his autism, and we help him find solutions for his challenges that work for him while advocating for society to be accepting of him and all people with neurological differences. On the flip side, I have friends who have been completely devastated by their children’s autism. They use person first language, they would take away autism if that was an option, and they focus on autism therapies that help their child fit in more to society as it is. Every parent is on a different journey, so asking how they’re doing with this big news is helpful. Then, take it a step further and meet them where they are! How Can I Help Your Child? This one is so huge, I can’t explain it enough. Whether you’re a teacher, a volunteer in the church nursery, a friend of the family, or just a parent of a kid in the same class, this question will make you an autism mama’s best friend. But it comes with a rule. If you ask, you have to actually make an effort to help. Please don’t ask for ways to help my child, and then ignore them all as soon as I’m out of the room. Now, I know, you’re probably not specifically trained in autism or special needs, but anyone can help a child with autism. Whether that means explaining things to them a certain way, offering foods that they can actually eat, or even just talking with your child about why my son doesn’t do things the same way others do. It’s also really important to get these tips from the parents. My son has to handle transitions using “first this, then that”, but a friend’s son has to have a clock time that something will happen. Again, all children with autism are different, so just ask the parents! This one has the same rule, if you offer you have to actually be willing to try and follow through. All mamas have seasons where they need help. This just applies ten-fold to special needs moms. Part of that is because we tend to put ourselves last and ignore our limits even more than typical moms. Part of it is because it’s harder for people to help when they aren’t familiar with special needs. And part is because people honestly don’t know what to do. When someone has a new baby, you know they need meals, that’s easy! When someone has surgery, you can help set up people to walk their dog. But when someone has a child with autism, it’s not an event that people can swoop in and fix, it can be a day to day struggle. Should you make meals? Oh, but there might be food restrictions. Should you offer to babysit? That might throw off the routine and lead to weeks of issues. So what do you do? Simple. Ask the mom! Maybe it’s watching the other kids while she takes one to therapy. Maybe it’s just scheduling a play date so that she sees adults besides just therapists. Maybe it is bringing a meal so that she doesn’t live on the frozen chicken nuggets that her son tolerates. Just ask, and then follow through! Is There a Charity I Can Support? If charity is your thing, I’m all for it, but please, please, please do not give blindly! There are many autism organizations out there doing great things for autistic people. Then there are charities that are not. Unfortunately, the largest autism charity that most people think of first is autism speaks. This organization uses only 4% of their budget actually helping families affected by autism, they use horrible marketing techniques designed to make people fear autism, and the goal for a lot of their research is to find a prenatal test for autism so that women stop having autistic babies. You can read more about why I do not support autism speaks here. Now, I don’t expect everyone to know about this, so just ask the mom. I refer people to the Autistic Self-Advocacy Network. If none of the above work for you, a simple, “thanks for letting me know” will suffice. It’s definitely better than saying one of the things on this list. Just let them know that you’re glad that they feel comfortable sharing the information with you, and that’s that. For some parents, it can take a while for them to just be able to share their child’s diagnosis without falling apart. Just be there for them. That’s all anyone can ask for, really. Have I missed anything? What would you want someone to say to you? I like “Thank you for letting me know” the best. I am the type of person that likes to be informed. It makes it so much easier when people are informed and understand what’s going on! These are great, thank you for giving great outreach starter points! Oh thank you! 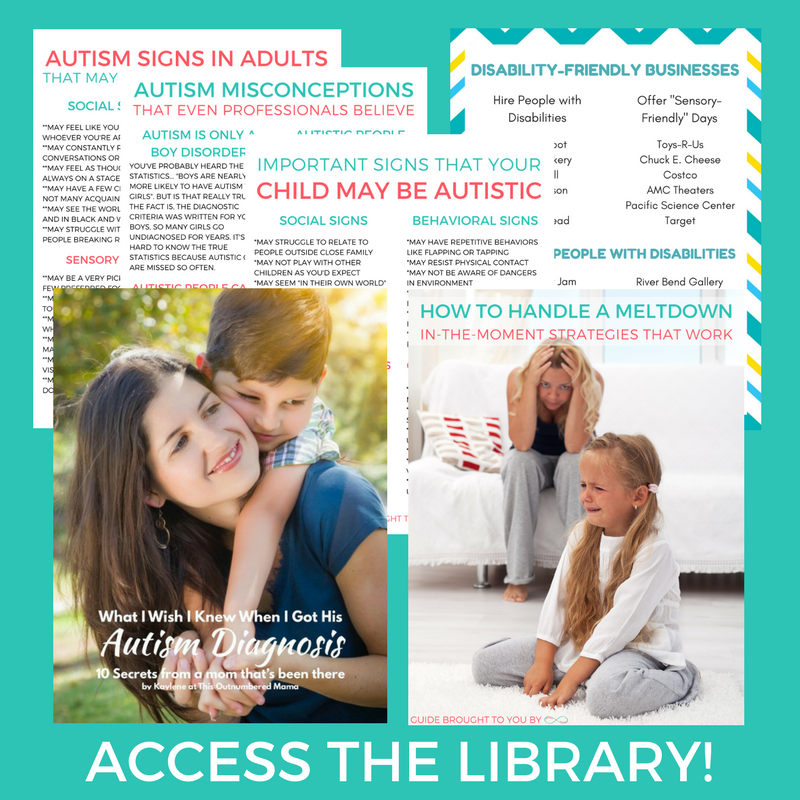 It can be overwhelming to hear that a loved one is facing autism, so I am happy to help! Awesome list and very much needed! I like to believe that most people want to be there for us, but just don’t know how! This list will make things much easier for people who genuinely want to help!! Agreed! People really mean well, it can just be really intimidating!